I flew an airplane last weekend and have a new appreciation for the value of the rudder pedals. 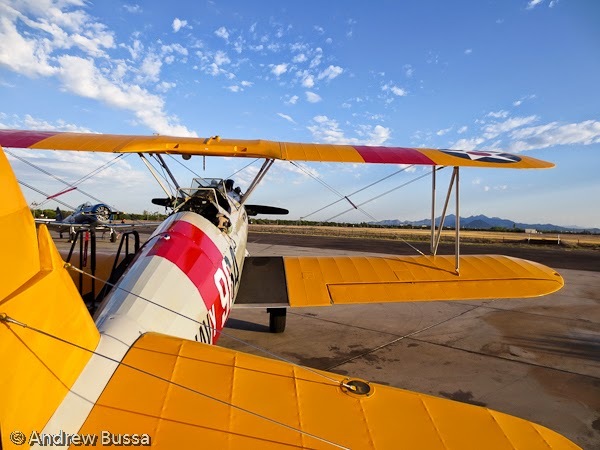 The Commemorative Air Force Arizona Wing offers rides in a few of their old military aircraft. 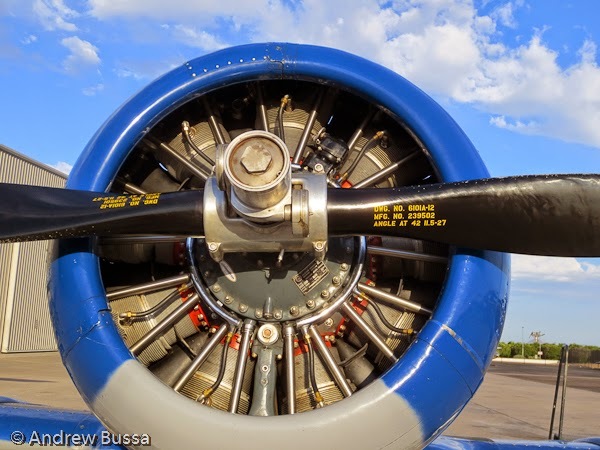 The B-17 and B-25 bombers are on a summer tour, but the transport planes and single engine aircraft are there all year. 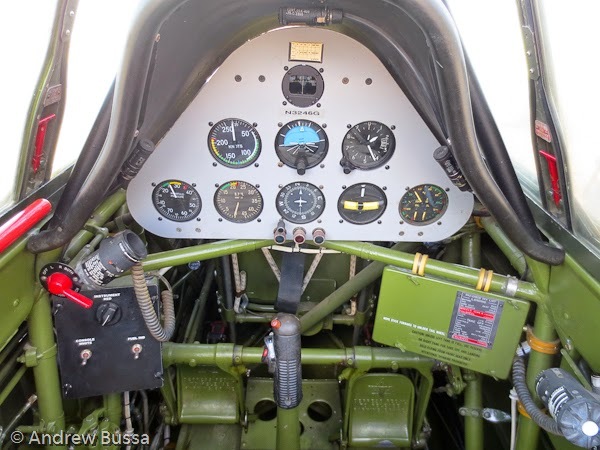 I decided to go up in the North American T-6 Texan trainer. It was a close call between that and the Boeing biplane. 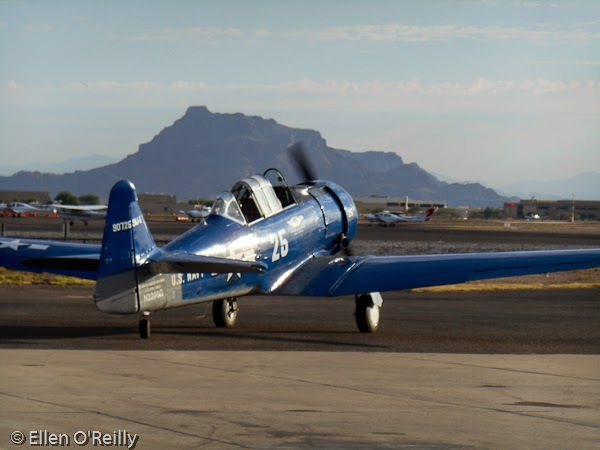 The T-6 has the pilot in front and the student in the back. The experience is about 50 minutes from engine start up to stop. I showed up early, signed some paperwork and toured the hanger with planes that weren’t flying that day. The volunteer staff loves what they do and are happy to share stories and answer questions. 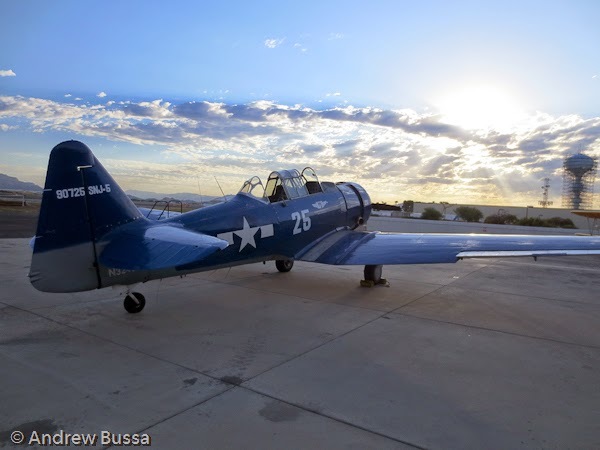 I was the first to go that morning and the pilot, "Sky," did preflight checks on the T-6 then invited me over to introduce me to the aircraft and some safety notes. 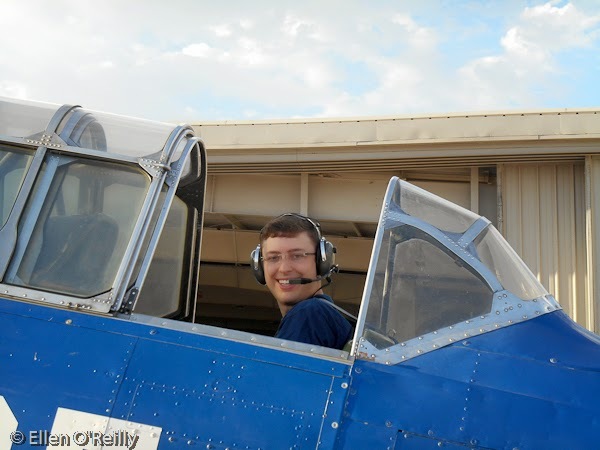 I was buckled in, shown how to operate the canopy (needs to open for takeoff and landing to facilitate a quick exit), instructed on the intercom and shown the controls. I was excited to go and liked to idea of flying in a convertible until the 350hp engine started. The noise and wind were incredible and we were still parked. The power was increased and we taxied out to the runway. 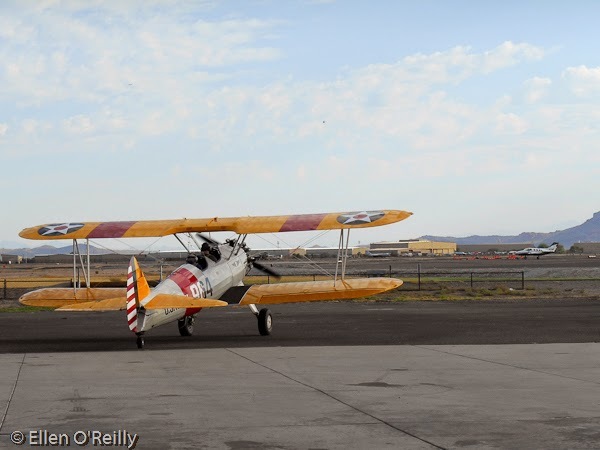 It was a busy morning at Falcon Field and a few flight school planes and the Boeing biplane departed before us. Our turn came quickly and we were at full power with the canopy open. The roar of the engine and the rush of the wind were tremendous. The tail lifted off first then the main gear and we headed to the east and gained altitude. I closed the canopy after we left the airport and started shooting away with my camera. 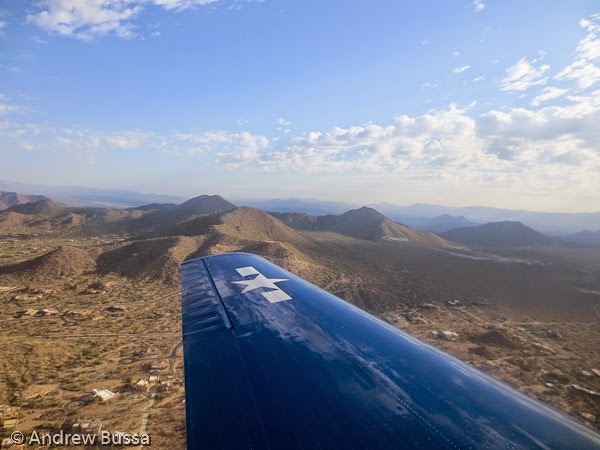 We flew over to the Tonto National Forest and I took in the sights. Pretty soon "Sky" came on the radio and said he was going to give me a quick lesson and hand the controls over to me. I caught onto the stick movements and the rudder movements, but doing them all together didn’t quite link up in my head. No matter, I was at the controls and having a blast. I started with banking left and right, adding the rudder inputs on a delay. Then I tried nose up and down and had fun making my own roller coaster at the limits of my air sick tolerance. It was fun and I soon got the hang of it, though not perfect, the instruments and were acting like I wanted. "Sky" said I was doing well and tool back the controls to give me a challenge. We started banking heavily left then right and back while he was explaining the challenge. I came on the intercom and stopped him before he could finish mentioning my stomach wasn’t up for it and we did some straight and level sightseeing before heading back to airport. I had the air sick bag out, but didn’t need it. We landed smoothly and zig zagged back to the hanger. I was able to stumble out of the plane and felt like I needed a walker. 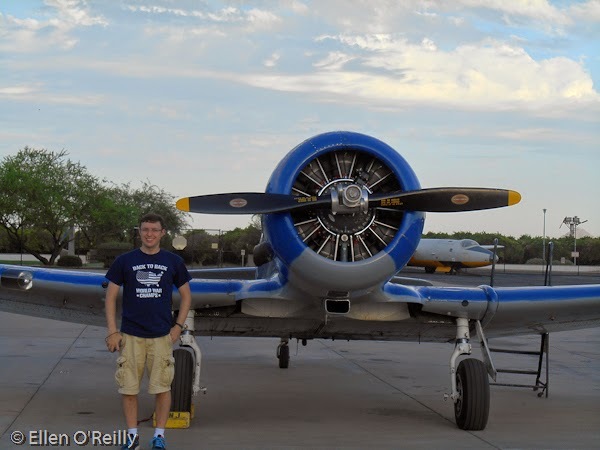 After standing still for a while, I was able to tour the museum and look at more classic war planes. It was an amazing experience and I’d go back if I’m in the area again, but ride the biplane instead; all those passengers were able to walk normally when they climbed out.